Maria Francoise Therese was born on January 2, 1873, in Alencon, France, the ninth and last child of fervent Catholic parents, Zelie and Louis Martin. After the early death of her mother, when Therese was only four years old, the family moved to Lisieux. Because of the excellent religious spirit in the home and the upbringing given her by her two older sisters, her love for God and desire to please Him alone in everything was awakened from the tender age of three. 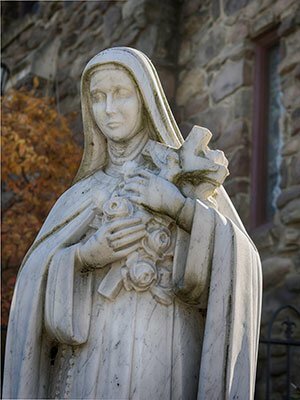 She entered the Carmel of Lisieux when she was 15, after overcoming many obstacles. There she led a hidden life of heroic, joyful virtue and continual sacrifice, and after undergoing long months of extreme spiritual and physical suffering, she died of pulmonary tuberculosis on September 30, 1897, at the age of 24. "The only way to make rapid progress along the path of divine love is to remain very little and to put all our trust in Almighty God. That is what I have done."